Not only did Travis Pastrana pull off the feat flawlessly, he managed to set a world record as well! American stunt rider Travis Pastrana successfully backflipped between two barges on London's River Thames. A jaw-dropping video shows how easily the daredevil cleared the 75-foot gap. Not only did he pull off the feat flawlessly, he managed to set a world record as well! 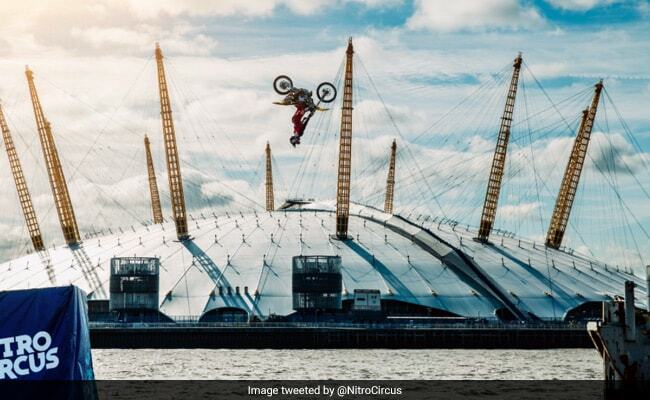 Travis Pastrana put his skills to the test as part of the launch of Nitro Circus' UK and European tour. Organisers say he pulled off the stunt on Thursday, while battling high winds and rain to launch himself from one barge to another on the River Thames. "I definitely couldn't breathe while he was doing it. It was so incredibly windy I thought even I'd blow into the Thames," tweeted one person who witnessed the stunt as it happened. "He makes it look so easy," tweeted another. Reckless or brave? Let us know what you think of the stunt in the comments section below.